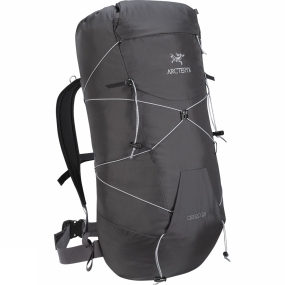 The Cierzo 28 Rucksack is an ultralight, streamlined pack designed for summit assaults and single day climbing trips, with a feature set that expands its versatility. Made from high-tenacity nylon fabric, the pack is tough yet weighs a mere 545 grams.Sized to carry a day's load, the Cierzo 28 has a spacious main compartment, and adds several smart features that expand its ability to handle necessary gear. The ingenious SwiftCord drawstring serves a compression system and carrying tool. Designed so the user can configure it to fit their specific carry needs, the SwiftCord helps secure a hardshell or belay parka, crampons, or sleeping pad. Two ultralight aluminum toggles work with the system to carry ice or mountaineering tools.The main compartment is hydration bladder compatible and features a glove-friendly pull-to-open/pull-to-close drawcord system, and a top compression strap that can secure a climbing rope. An external pocket holds small essentials, and an internal pocket stashes wallet, phone, headlamp, and clips in keys.The pack's narrow profile stays out of the way while climbing, and balances well while scrambling. The back panel is padded with a removable high-density closed cell foam sheet for improved carry comfort.